Sadly, there's not many wine workshops or short wine appreciation courses conducted these days on a regular frequency. It will be good to see more casual yet informative workshops with the aim to inform and educate wine enthusiasts. 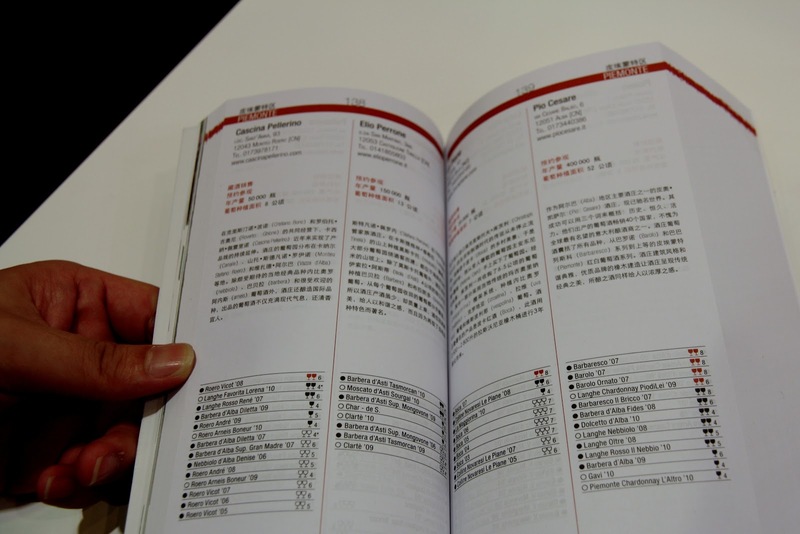 A little education goes a long way to bolster one's confidence when it comes to exploring wines, especially those from not so well known wine regions. If you are free Thursday afternoon next week and keen to learn about Bordeaux wines, this may serve as a good opportunity for you :) For more info you can always call Malcolm. 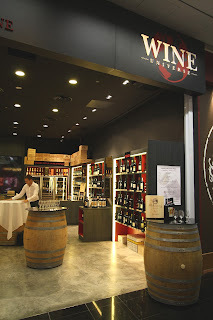 Wine Universe Wine Shop (located at 9 Raffles Boulevard, #01-107, Millenia Walk) is launching a new wine club called ‘Wine Universe Wine Club’. 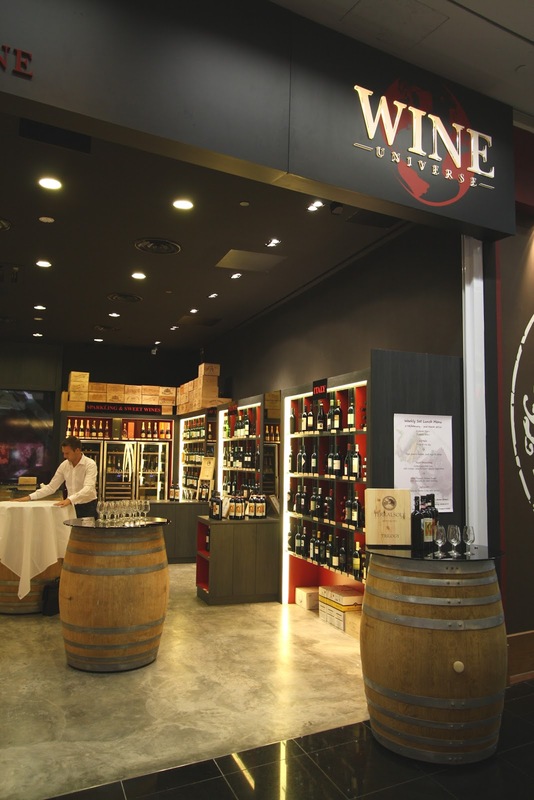 Since this wine shop carries a good range of wines from various wine regions, Thomas Le Moal of Wine Universe has decided to showcase wines from different wine producing countries this time round. The fee for tasting is $40 for non-members. For members of this wine club, the tasting fee is priced lower at $35. Those keen to attend this tasting or join this new wine club can contact Thomas at 96425930 or via email at: thomas@wine-universe.com.sg. If you like to know a little more about this place, you can also read this blog entry: Wine Universe. 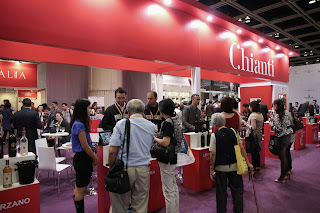 The Hong Kong International Wine and Spirits Fair 2012. 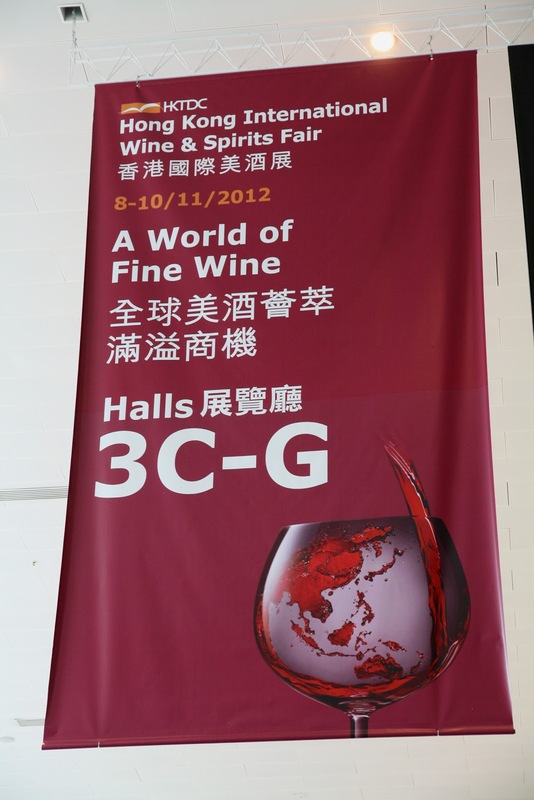 I visited the '5th edition' of this fair held at Hong Kong Convention and Exhibition Centre (HKCEC) between 8 Nov-10 Nov 2012. For me its an 'annual pilgrimage' to not just undertake business errands, but equally as important to go discover something new and something different in the 'wine world'. Every year this wine event throws me a surprise or two; be it in offering me a wine varietal I have not tasted before, or in the particular use of a varietal to make a different style of wine, or even wines from a wine region I have not had the chance to taste before. This year was no different. There were surprises to be found and a little more knowledge to be learnt from the world of wines. With wine exhibitors from more than 35 countries and more than 900 booths being readily occupied, one can safely proclaim that this is a 'big' event; one which is difficult to satisfactorily cover in 3 days.Visitors have to be selective and focus on a few areas to explore and discover wines from, and leave the other booths with more than a tinge of regret. Like the previous years, wines from France, Italy and Spain took on a bigger floor space and presence than wines from other countries. 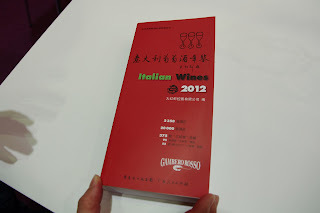 Italy in particular seem to be making a concerted and innovative effort in promoting its wine and wine culture to the visitors by not only holding wine workshops, but also having a booth demonstrating how to cook pasta (which attracted a good number of visitors), and having another booth distributing a Chinese language version of 2012 Gambero Rosso Italian wines rating books, as well as a thick book on Italian Wines and Wine making (in English) which were distributed freely to trade visitors. Photography being a hobby, distraction and often a delightful curse, I took the opportunity to capture some wine moments witnessed during the 3 days' event. 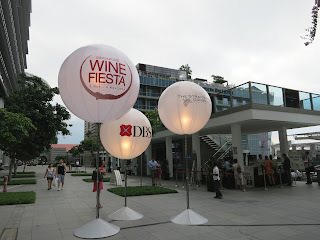 This weekend I went along with a few friends and visited the Singapore Wine Fiesta 2012 held at Customs House. 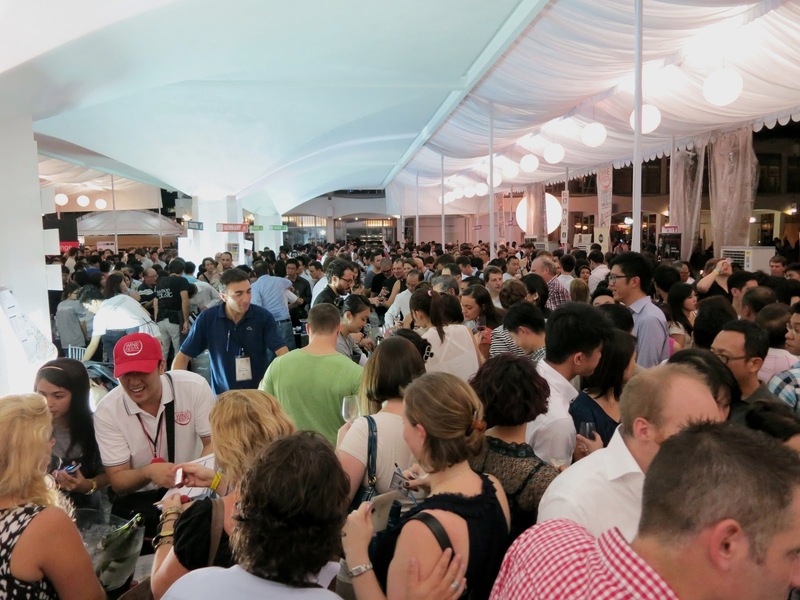 Slated as the largest wine event for the general public in Singapore, it certainly pulled in a good crowd. The tasting guide highlighted ‘65 cabins’ (wineries), each offering their liquid wares for tasting and sales. I took the opportunity to take pictures of this event. The pictures include participating winemakers, winery owners, wines and folks in general enjoying their weekend at this tasting. 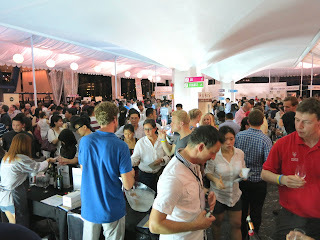 You can have a look at the pictures via this link; Singapore Wine Fiesta 2012 photo album. 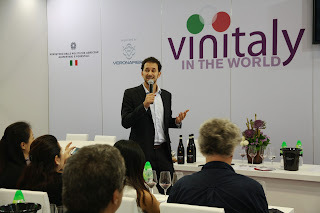 Suffice to say, this event had the strong support and eager participation of a good number of wine enthusiasts. The first 3 hours of each day provided some quiet moments to talk to winemakers and winery reps. 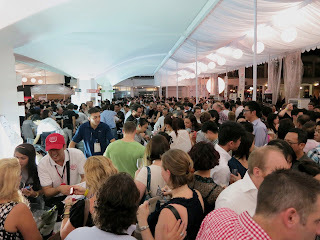 But by the later part of each day's tasting, the place was challengingly packed. If the aim of the organizer is to introduce wines in their portfolio to wine consumers in Singapore, then that goal would have been satisfactorily met with the number of people who attended this event. The visitors by and large seem to loosely fall within three categories in their pursuit for wine over this weekend. The brand seekers. Three oft mentioned wine brands during this event were Yarra Yering (Yarra Valley, Australia), Leeuwin Estate (Margaret River, Australia) and Mischief and Mayhem (Burgundy). I met wine folks who during conversation mentioned that their friends have advised them to look for these labels and to try wines from these wineries without fail. These wineries, having over the years built a degree of recognition for quality in the minds of consumers, tend to find ready enthusiasts keen to taste their wines. The sweet sippers. Tables having sweet wines also found eager wine enthusiasts waiting to sip some the sweet nectar. Villa M wines (served at cabin 34) saw a constant demand for its 2 wines; Bianco Moscato NV and Rosso Brachetto NV. The young man serving these wines was certainly kept busy. Another popular table was Cabin 46 where the Hungarian Tokaj-Disznoko 2009 Late Harvest Furmint and 2002 Aszu 5 Puttonyos Tokaji were served. This table was so popular that the sweet wines ran out in a few hours leaving a fair bit of disappointed consumers who came for the event later in the evening. Max Ferdinand Richter (cabin 44) and Schloss Schonborn (cabin 45) showcased rieslings among which the Kabinetts and Spatlese ones offered sweet respite. Delas wines (cabin 24) had a 2009 Muscat de Beaumes De Venise which had enthusiasts bringing their friends to the table to try. Two unique sweet portions came in the form of Rubis (cabin 48) which offered a ‘chocolate wine’ and Bibich winery’s (cabin 47) Ambra Prosek NV, a dessert wine made from white varietals known as Debit and Marastina. The explorers. A small group of wine folks were eager to sip wines from less known wine regions (at least less known in the local market that is). Towards this end they made their way to Japan’s Grace Wines (cabin 22). These wines made with Koshu grapes attracted quite a bit of interest. Lebanon’s Chateau Kefraya wines (from Bekaa valley) and Croatian wines from Bibich (North Dalmatia), Boskinac (Pag island), Coronica (Istria), Korta Katarina (Orebic) and Meneghetti (Stanija) were the other labels sought by folks who wanted to taste wines made from not-so-known varietals and regions. The atmosphere was certainly different from the sombre, seated wine tastings conducted in hotels or when one is at trade wine fairs :p And I think its alright to have these occasional big wine fairs where exuberant folks explore wine in an informal setting in the company of friends. Who says wine must be a straight-laced, serious affair? :p The price for the event, being reasonable for the number of wines offered for tasting, may be one reason for the strong turnout. The Vintner's Tour is swinging by South East Asia. Singapore, Jakarta and Bali will get to savour some old world wines, interact with winemakers, check out some masterclasses and indulge in wine-paired meals between 21-28 Nov 2012. One particular 'value for money' wine event to be held in Singapore is the Wine Treasure Hunt Challenge held on 24 Nov (Sat) at Capella Sentosa (yes, you have to cross over to the little island if you wish to partake in this event). This event is priced at $68; a reasonable amount for a tasting of around 200 wines. You can also attend masterclasses on the same day. There's 4 of them priced between $28 and $68. There's also wine-paired meals arranged at various eateries if you are more keen to sit, wine and dine in a relaxed atmosphere. If you are free on the 24th, you should head down to Capella. 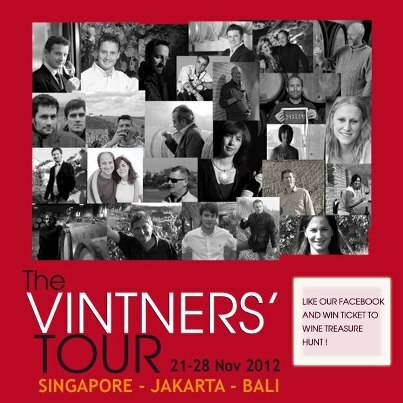 For more information check out: http://www.ewineasia.com/index.php/the-vintners-tour-2012.